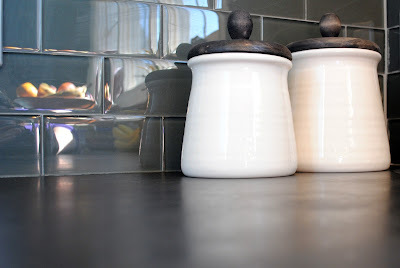 After we installed our Richlite countertops in our kitchen, we were deep in the midst of moving in and getting settled. We actually waited a couple of weeks before we oiled the countertops to finish them. You can read about our installation process here. This is what the Richlite looked like at this point. After the installation, my husband sanded the countertops again with the orbital sander. They were much smoother now than when they first arrived. It had been used for a couple of weeks and you can see the markings and discolorations on it. We scrubbed it with warm, soapy water, rinsed everything, and let it dry well. 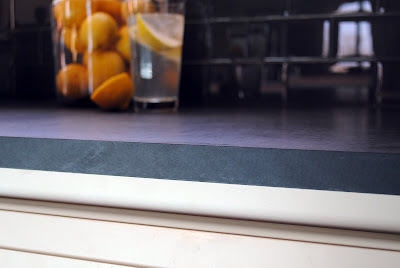 We used Bioshield Wood Counter Finish to oil the countertops. It is a combination of a few different oils and can be used on a variety of kitchen surfaces. We bought ours from Amazon and just spread it on with a clean paintbrush. The change in color was immediate and dramatic. You could tell some of the oil was being absorbed almost immediately. We left it like this overnight to let the oil soak in. The next morning, the shiny, wet look was gone. It still looked a little oily, but most of the oil was dry. You can see that the discolorations and chalkiness are gone. The color deepened to a rich brown color. We used paper towels to wipe it all down and remove any excess oil. I love how the color variation almost makes it look like there is a texture, but it's smooth and reminds me of leather. Fast forward one month: The countertops still look really good. We haven't re-oiled them yet, but I'm guessing that we will in the next month or so. The color is still very dark, but it doesn't always look brown. Depending on the light, it can look charcoal or even black. I'm still happy that we chose the Chocolate Glacier color rather than black. It's nice to have something a bit unusual. 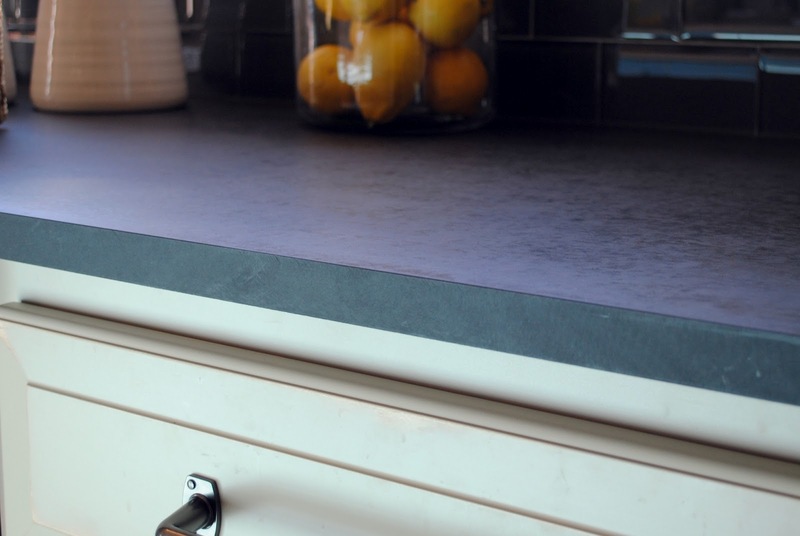 We know that these countertops will get scratched and worn...and that's okay. It fits with our house and we like the potential patina that the Richlite offers. 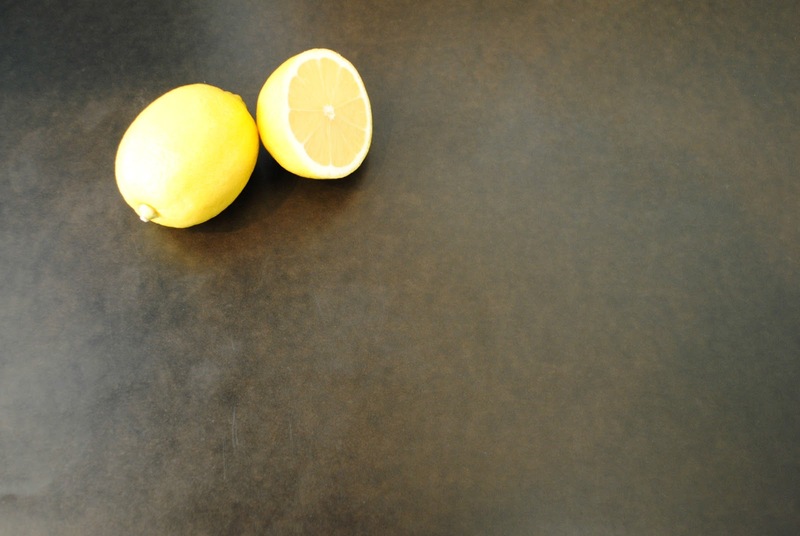 If you get a really bad scratch, you can sand the countertop and then re-oil. While we haven't had any really bad scratches since installation, all of the scratches and scuffs that were present upon arrival sanded out just fine. I had a few people ask me about the edge of the countertops. Did the cut edge look different, does it feel different from the top, etc. Obviously, we went for a very basic, plain edge. We didn't try any kind of bevel or rounding. Once we sanded and oiled them, there was no noticeable difference between the edge and the top. We applied oil to the edge, just like we did the top surface. Almost everyone who walks into our kitchen for the first time lays their hand on the countertops and then asks "What kind of countertops are these???" The look on their face when you tell them it's recycled paper is hilarious. You would never guess it by looking at them or touching them! Wow, this is pretty amazing. I have never heard of this product before. Very cool! It looks great. I remember hearing about Richlite about two years ago, and always wanted to try them on a project. I never got the chance, but I love the look of them. I'm always happy to hear about people who choose something other than granite. :) Your countertop looks beautiful! I'd love an update on how your countertops are wearing almost 2 years later? I'm considering these for our new kitchen, but would love any info you can offer! I would love to know how your countertops are doing also. Me too. I'm debating Richlite for my kitchen remodel. Pictures 6+ years later would be awesome, as well to hear if you're still happy with the product and level of maintenance.